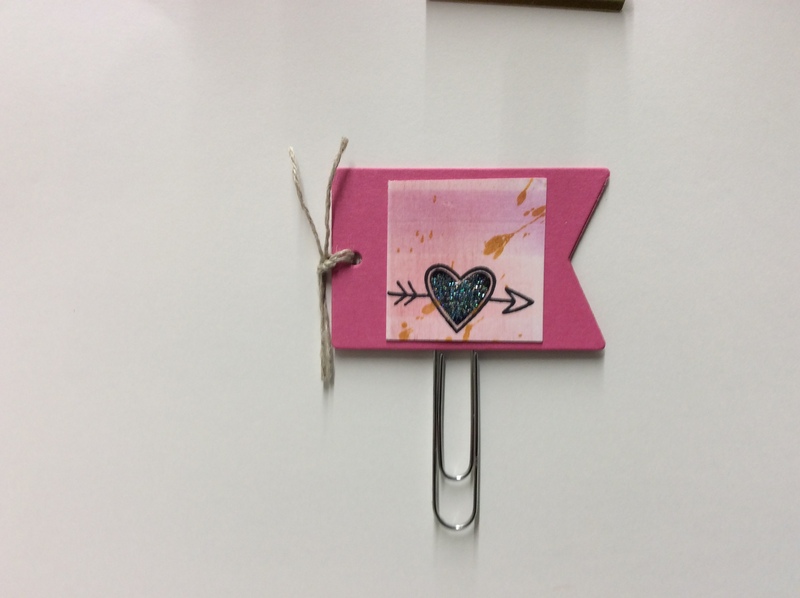 Using all FunStampersJourney product with the exception of theJumbo Paper Clips and the industrial strength glue( E6000 Clear ) . Be careful this glue is really industrial strength! Using Watermelon Fusion card stock cut 2 pieces with the Everyday Tags DI-0255 . Using the E6000 glue, glue together just the top portion of Clip,with Jumbo Paperclip in the middle forming a sandwich. Let dry completely then assemble with a square piece of WhipCream card stock that has been washed with pan pastels in a plaid formation and sprinkled with Gold Silk. Cut into 1 1/4 inch square and stamp with Black Licorace Ink using the Stamp Set Planner Elements SS-0402. Using the picture as your guide. Decorate the inside of the heart with Journey Glaze and Journey Sparkle Dust. Let dry and finally using Natural Journey Thread tie a cute knot in the punched out circle.